The start of every successful concrete project involves careful planning and follow-up, whether you handle the project yourself or hire a concrete contractor. Involving a professional concrete contractor may be wise if the project is very large or complicated. Hiring a contractor also relieves the home or property owner of a lot of the planning, preparation and direct project management. However, if a contractor is used, be sure to request and receive lien waivers, from all contractors and sub-contractors involved, upon payment and completion of the project. If the contractor fails to pay the suppliers for materials or services on your project, they are still entitled to file a lien against your property for the price of their product or service to ensure payment. Concrete is an excellent construction material for many applications. The expected use of the concrete will help determine the required thickness and any special properties. The load carrying capacity of a slab is primarily dependent on thickness. A four-inch-thick slab will handle common weight loads such as foot traffic, light storage, cars, pickups, light tractors and animals. Whereas a six-inch-think slab will handle most medium-duty weight loads, such as motor homes, straight trucks and larger equipment. Reinforcement materials such as wire mesh, fibers or rebar add strength and durability to the slab and reduce cracking and shifting. Unusually heavy vehicles or high-traffic projects may require special design consideration. Start by removing all organic matter, such as grass, weeds, wood and any pockets of soft or water-soaked soil. In some cases, the slab can be placed directly on undisturbed soil. If any of the sub-grade or base has been disturbed, fill may be added to raise the final height of the slab and create uniform depth or thickness of concrete. Any fill should be placed on undisturbed soil and compacted in layers six inches thick or less. For soils with questionable drainage, such as clays or soft black dirt, use a fill base of four to eight inches of compacted sand or fine gravel to help disburse water and reduce settlement. Never place concrete on muddy or frozen ground. Use 2x4s or 2x6s to form the parameter of the slab. The tops of the forms need to be set to the desired final height of the slab. Lumber should be straight and staked at two-foot intervals to minimize form bowing. After forming is completed, check the slab thickness. Using a stringline or straightedge across the top of the forms, measure the depth to the base or sub-grade. Pay careful attention to the depth or slab thickness. Variances as small as one inch can result in up to 25% more concrete being required, based on a four-inch-thick slab. Check the weather forecast before ordering concrete. Ideal temperatures for placing concrete are between 50°F and 90°F. Warmer temperatures will make the concrete dry quicker, leaving less time to complete the job. Lower temperatures will lengthen the amount of time for the concrete to dry. Newly placed concrete should not be subjected to temperatures below 40°F for at least a week. Concrete is ordered by the cubic yard. It is calculated by multiplying the surface area by the thickness in feet to determine the total volume in cubic feet. Divide this value by 27 to obtain the volume in cubic yards. It is often wise to increase the calculated volume by five or ten percent to help account for slight deviations in slab thickness, spillage, etc. Sufficient manpower and tools should be ready before the concrete arrives. Ideally, concrete should be in place less than 90 minutes after batching at the ready-mix plant. Place concrete as close to its final position as possible, not in large piles. Screed the concrete using a sawing action pulling a straight board along the top of the forms. One of the most common mistakes at the job site is adding too much water to the concrete mix. This is done to change the consistency of the concrete, but should be done sparingly. Too much water can reduce strength and durability, leading to the formation of shrinkage cracks. After the concrete is in place, the surface needs to be finished. Finishing involves settling the aggregate and removing surface imperfections. Start by using a bull float, this helps to push the aggregates below the surface allowing for subsequent finishing activities. A wooden or metal hand float or trowel is used to remove slight surface imperfections. An edger, which is like a short steel trowel with a rounded side, is used adjacent to the forms and along the parameter of the slab. When correctly used, an edger produces a more attractive rounded edge and can reduce chipping or breaking along the edge. Steel troweling follows floating and edging when a smooth, dense surface is desired. Timing is important in this operation because if delayed too long, the surface becomes too hard to trowel. All outdoor slabs subject to weather conditions should be broomed. Brooming the surface after floating or troweling is the last step in finishing that produces an abrasive, slip-resistant surface. Concrete shrinks slightly as it dries. Once fully dried, seasonal changes in temperature cause the concrete to expand and contract, which can lead to cracking. Control joints are cuts in the surface of the slab approximately one-quarter of its thickness, purposely placed to position cracks in predetermined locations. Jointing tools can be used if done during finishing and saws with concrete or masonry blades enable you to cut control joints after the concrete has dried. A good rule of thumb for control joints is to double the thickness as feet. For example a four-inch-thick slab should have control joints placed every eight feet. After the concrete has set for 12 or more hours, careful consideration should be given allowing it to cure. Fresh concrete should not be subjected to temperatures below 40°F for at least a week. When pouring concrete in cold weather, some type of insulation should be used to keep the concrete surface from freezing (e.g., insulation blankets or straw). Inversely, concrete should not be allowed to dry too quickly in very warm weather. When pouring concrete that is in direct sunlight with temperatures in excess of 90°F, it is recommended to keep the surface damp with a light water mist, dampened straw or flooding to enhance curing by supplying additional water. 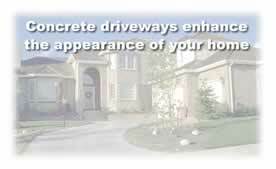 Concrete residential driveways enhance the appearance of the home and will provide many years of service with minimum maintenance. In order to maintain a durable driveway that will be relatively free of surface blemishes throughout its service life, the homeowner should carry out the following recommendations. Don't drive on new concrete for at least seven days. Don't allow drain water to undermine the slab and cause settlement cracks. Don't allow snow and ice to accumulate on the slab during the first winter. Keep it cleaned off. Refrain from the use of de-icing chemicals (salt or calcium chloride) for snow and ice removal the first winter. Sand can be used for traction. Never use de-icers containing fertilizer ingredients such as ammonium sulfate and ammonium nitrate. Concrete should also be protected from exposure to liquid fertilizer systems used for lawn treatment. Scaling is one of the most insidious attacks on concrete and can happen even with quality concrete, yet there are methods of reducing and even preventing this yearly problem. Scaling of sidewalks, driveways and other exterior flatwork can be minimized. It is especially important that exposed concrete be sealed in climates that experience severe cold weather. A concrete sealer applied after 30 days will help to prevent water from entering the concrete during autumn rains and the intrusion of de-icing salts tracked onto driveways during winter months. One of the most economical and easiest methods of sealing is to apply boiled linseed oil thinned with mineral spirits, mixed approximately 1:1. The mixture is usually applied in two applications by roller, spraying or a squeegee. Resealing with this boiled linseed oil mixture should be done at least every two years. The concrete sealing should be done after approximately 30 days of air drying, when the surface is dry and preferably when the air temperature is above 70°F. It should be noted that some temporary discoloration of the surface may be expected when sealing with a boiled linseed oil mixture. River City Ready Mix has sealers available.